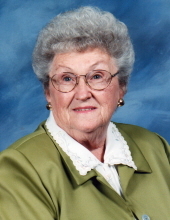 Age 91 of Owosso passed away Tuesday, April 2, 2019 at her home. Funeral Services will be held 11am Saturday, April 6, 2019 at Nelson-House Funeral Home with Pastor Marlene Webster officiating. Burial will follow at Oak Grove Cemetery. The family will receive friends at the funeral home on Friday from 6pm to 8pm. Shirley was the daughter of William Henry and Mary Ione (Metzger) Bryant, born in Eureka on June 15, 1927. She married Harry Hall Jr. on November 6, 1948 in Angola, Indiana; he preceded her in death in 1989. Shirley worked as a seamstress at Shell Pontoon (now Crest Marine) and at Mitchell-Bentley Corporation. She was a member of the Church of the Jubilee. Shirley is survived by her son, Jake L. (Paula) Hall; daughters, Karla Kaye (Jerry) Gilbertson and Jackie Rae (Joseph) Reynick; 3 grandchildren and many other loving family and friends. She was predeceased by her parents; her husband, Harry; two sisters and four brothers. To send flowers or a remembrance gift to the family of Shirley Ruth Hall, please visit our Tribute Store. "Email Address" would like to share the life celebration of Shirley Ruth Hall. Click on the "link" to go to share a favorite memory or leave a condolence message for the family.